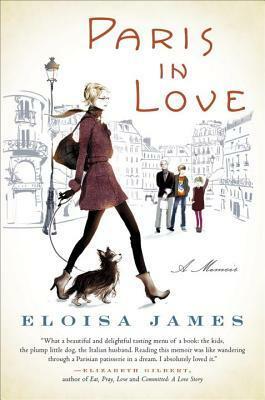 In 2009, New York Times bestselling author Eloisa James took a leap that many people dream about: she sold her house, took a sabbatical from her job as a Shakespeare professor, and moved her family to Paris. Paris in Love: A Memoir chronicles her joyful year in one of the most beautiful cities in the world. With no classes to teach, no committee meetings to attend, no lawn to mow or cars to park, Eloisa revels in the ordinary pleasures of life—discovering corner museums that tourists overlook, chronicling Frenchwomen’s sartorial triumphs, walking from one end of Paris to another. She copes with her Italian husband’s notions of quality time; her two hilarious children, ages eleven and fifteen, as they navigate schools—not to mention puberty—in a foreign language; and her mother-in-law Marina’s raised eyebrow in the kitchen (even as Marina overfeeds Milo, the family dog). 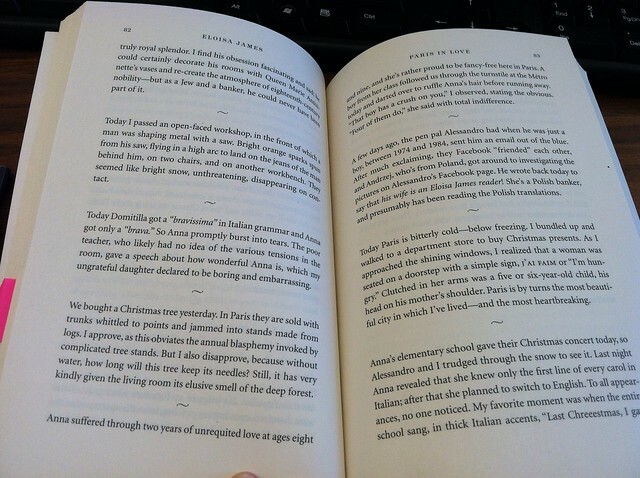 I was so excited to get an offer to review Paris in Love because I love travel memoirs. I was certain this book would be right up my alley (I mean, my blog has the word "Wanderlust" in the title. How can I pass up a travel memoir?) And I'm sure it would have been, had this book been given a narrative structure rather than, well, I don't know how to describe the structure. It was told pretty much in Facebook-status-update-sized vignettes. And while I love telling my own little stories to my friends and family via Facebook, I'm not going to compile all of them and put them in a book. The book didn't feel crafted; it felt slapped together. I could assemble all the posts I've written about my teaching life on Facebook and make a book out of it, but to me that's not writing; that's just slapping something together. The difficulty of writing is honing your craft to create an engaging narrative or informational piece of text. As someone who hopes to be a published writer someday, I'm kind of irked by the way this book was put together. I mean, anyone can assemble Facebook status updates, paste them into a Word document and turn them into a book. To me, the purpose of a journal/writer's notebook or even social media is to inspire bigger writing projects, not BE the writing project. But maybe for someone else this is just the type of book that they need. Short, quick, and with little emotional investment. That's just not the type of book for me. Oh, I think that would annoy me too! Just looking at the layout is enough to turn me off. Shame, because I'm always on the lookout for a good memoir. I completely agreed with your review of this book. I thought it was a shame that I received such a great looking book for review and then it turned out that I couldn't even finish it. BTW I love your blog! Definitely added it to my GoogleReader.